Mental Toughness Workshops - Mental Toughness Inc. If you’re a coach who wants to outfit your team with the mental skills to win or an athlete who wants a more economical way to get involved in Mental Toughness Training, then the Get Psyched Mental Toughness Workshops are your perfect fit. These workshops can be delivered individually or as a series that spans your season. And, because our workshops are designed to train the specific needs of elite, driven, competitive athletes, you’ll learn specific mental toughness tools that you can apply right away to boost your performance. Such was the case with National-Level Tumbler, Andres Rivendeneira. Prior to attending one of our Get Psyched Workshops, his performance was inconsistent both in training and competition. Andres was extremely frustrated with his performance and his self-confidence was wavering. He knew he could do so much better, as did his coach who approached MTI to help him get out of his own way and achieve his full potential. Mental Toughness Workshops give you that extra boost in your performance by training the one skill that is most undeveloped in almost all athletes: your mental skill, which becomes exceedingly obvious when it’s a clutch moment and the spotlight is on you. It is imperative that you practice and train your physical skill and strategy so that you can perform at the level you’re committed to, you already know that; however, most athletes do not take the same time and make the same effort to train their mental skills. Then they wonder why they’re not mentally tough when it counts. Mental toughness takes training too! Our Mental Toughness Workshops give you a crash course in mental toughness training and provide you with specific toughness training assignments that develop your mental skill for when you need it most. As a coach, these workshops are the perfect opportunity fo your athletes to get on the same page and support one another to perform in clutch moments. As an athlete, they’re an opportunity for you to really connect with your teammates and other athletes who have the same commitment to the pursuit of excellence as you do. Our workshops were developed from common concerns, fears, and performance barriers of high performers across all disciplines. So, although these workshops do not provide the same intensity of specialized and individualized mental toughness coaching as our private coaching programs, they specifically train mental toughness where you need it the most with the most effective tools possible. As a result, you will walk away from each workshop with specific tools and strategies to train your mental toughness so that you can perform well no matter what the circumstances. Accountability training using our innovative, self-monitoring Get Psyched App that’s packed with exercises and tactics to help your athletes up their game. An opportunity for an extra coach or parent training sessions (dependent on program) — to support ongoing mental skill development of athletes in between workshops. Email support —to help you give you that extra little confidence boost when you need it the most. Mantras, tools, and proven strategies provided as specific toughness training assignments—to help develop the mental edge of every athlete. How do the Get Psyched Workshops work? Just like with our private Mental Toughness Coaching, our Get Psyched Workshops are developed according to our ‘ACE’ Training process: Awareness, Coaching, Elevation. Each workshop attendee goes through the same ACE process to ensure optimal results, drawing from the needs, concerns, fears, and performance barriers of the over 10,000 athletes that we’ve worked with over the past 4 years. As a result, we have determined which tools will most efficiently and effectively support your peak performance. We know how busy you are, so we send our mental toughness coaches to you: We bring the Get Psyched Workshop to your training facility to maximize the learning and minimize the extra travel time. Our workshops are interactive, fun, and highly relevant which keeps you and your teammates engaged in the material thereby maximizing your retention of the mental toughness training. For athletes and performing artists under the age of 18, we request that parents also attend all workshops to promote communication and effective mental toughness development outside the workshop. You contact MTI using the form at the link below. You work with your Mental Toughness Coach to design a Get Psyched Workshop that best fits your needs. You book a date and location for your workshop and you invite/confirm the attendees and collect the payment if needed. Athletes, parents, coaches attend the workshop, engage in the exercises, and receive the toughness training assignment specific to your needs. You’re involved in engaging, hands-on activities that are guaranteed to strengthen your mental toughness. After the workshop, your mental toughness coach is available for questions via email. You are held accountable for your toughness training and are debriefed on its effectiveness during at the next workshop (if booked). 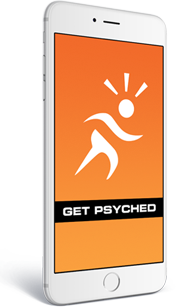 Ongoing mental toughness training is supported by the Get Psyched App. While the workshop format is obviously not as individualized as the private coaching model, athletes and performing artists still acquire significant mental toughness improvements and overall performance results using this workshop model. The effectiveness of our workshops is made possible by our commitment to analyzing the mental toughness patterns of the over 10,000 athletes we’ve worked with over the last 4 years. So, our Get Psyched Workshops address the most prevalent concerns, needs, fears, performance barriers documented across this large sample of athletes and high performers. As a result, our workshops will teach you the exact tools you need to most efficiently and effectively get started on training your mental toughness. What exactly will we be working on? Establishing a fear and anxiety management routine using specific fear-blasting tools and procedures. Whenever you’re adding new training principles, some extra time is needed; we’ve tried to minimize the time required while maximizing your performance. The Get Psyched Workshops are delivered in your training facility at a time that works best for you to best fit your busy training schedule. And, as a bonus, the majority of our mental toughness tools and strategies can be practiced alongside your current training so that your time, and most importantly your performance, is maximized. In addition, as you get “out of your head” you’ll experience having more time than before because you’re no longer wasting time trying to figure things out or worrying about your what ifs. So, even though mental toughness training technically takes more time, often the end result is more free time! Get Psyched Workshops are one of the most economical ways for you to work with a mental toughness coach since the cost is distributed amongst all athletes in attendance. Therefore, with our workshops you will be exposed to highly effective and efficient mental toughness tools and strategies without breaking the bank. I think you will find our workshops to be VERY inexpensive, especially given the value they provide. What if I’m not the right age? What if you’ve never worked with my sport or discipline before? While we might not be technical coaching experts for your specific sport or discipline (for example, we might not know the difference between a double back and a double fault), we ARE experts in mental toughness. So, it really does not matter your sport or discipline, as we’re not critiquing you on that. Where are you breaking down? What mental toughness tool will support your performance breakdown? In short, our Mental Toughness coaches are experts in identifying mental performance barriers regardless of your sport or discipline. After having coached thousands of athletes over the last 4 years to breakthrough, often unimaginable, performance results, we know our methodology works for all athlete and performing artists of all disciplines (and we’ve worked with some ambiguous ones!). To get the most value out of the workshop, you need to apply the mental toughness coaching from the workshop to your training and practice it with the same diligence that you practice your sport or discipline. If at any time you have any questions or concerns, just send us an email: we’re always ready to provide extra coaching to support your peak performance. GET YOUR TEAM’S HEAD IN THE GAME, BOOK A GET PSYCHED MENTAL TOUGHNESS WORKSHOP. What if I’m still not sure this is for me? If you’re still unsure, send us an email with any other questions you might have. You are under no obligation in filling out an assessment, so might as well find out more. And, make sure to peruse our testimonials to see the real-life results that our Mental Toughness coaching and workshops have provided for our athletes. INQUIRE ABOUT GET PSYCHED WORKSHOPS TODAY!